It was pointed out to me that I made a small error, in my article, for the Rite Word last month and they were absolutely right. We will be selecting the movie to be shown on April 12th . If anyone has a movie that they believe is a good family picture, feel free to submit your choice to me. The preparation for the Spring Reunion has commenced. The different degree teams are working very hard to bring the very best performance to our candidates. We have, as of our last stated meeting, 13 candidates. If we get one more mason to make San Jose their Rite home, we will have the largest class in 10 years. 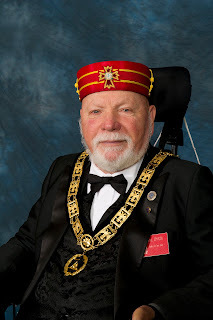 My Brothers, the application for the Scottish Rite is in the Rite Word. So, we have the candidates, we have the different degree teams practicing, and the only other thing we need would be side-liners to witness our degrees. The full schedule of the spring reunion is also in this issue. Please, my brothers, look at the schedule and try to attend as many degrees as you can.